This experiment is your introduction to the servo motor, which is a smart motor that you can tell to rotate to a specific angular location. You will program it to rotate to a series of locations, then sweep across its full range of motion, and then repeat. Unlike the action of most motors that continuously rotate, a servo motor can rotate to and hold a specific angle until it is told to rotate to a different angle. You can control the angle of the servo by sending it a PWM (Pulse Width Modulation) pulse train; the PWM signal is mapped to a specific angle from 0 to 180 degrees. Inside of the servo there is a gearbox connected to a motor that drives the shaft. There is also a potentiometer that gives feedback on the rotational position of the servo, which is then compared to the incoming PWM signal. The servo adjusts accordingly to match the two signals. In this experiment, the servo is powered through 3.3 volts on the red wire and ground on the black wire; the white wire is connected to pin P0. Connect 3x jumper wires to the female 3-pin header on the servo. This will make it easier to breadboard the servo. ⚡ Note: Controlling a servo with the micro:bit&apos;s 3.3V pin is not intended to give you a highly accurate angle of rotation, just basic movement from one position to another to get your project movin'. 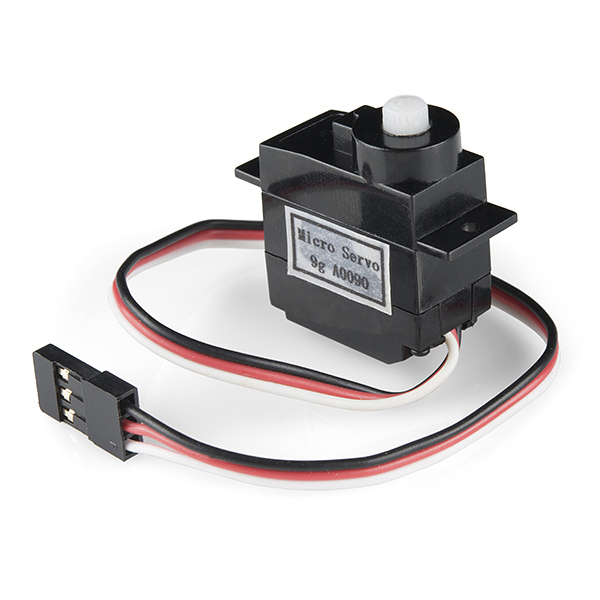 If you are looking for a higher degree of accuracy from your micro servo, we recommend powering your servo motor with the recommended operating voltage with an external power supply of 4.8V to 6V. Don't forgot to connect ground from the external power supply for reference. One of the major drawbacks to using MicroPython with the micro:bit is that you can't import third-party modules. Or at least, we haven't had any luck flashing two Python files to the micro:bit. This code seems long because we had to paste the Servo Class code into our script. Ignoring the Servo Class code, let's look at what's happening inside the forever loop. The range function generates a list of numbers. In this experiment we are generating a list from 0--90 that increases by 5. 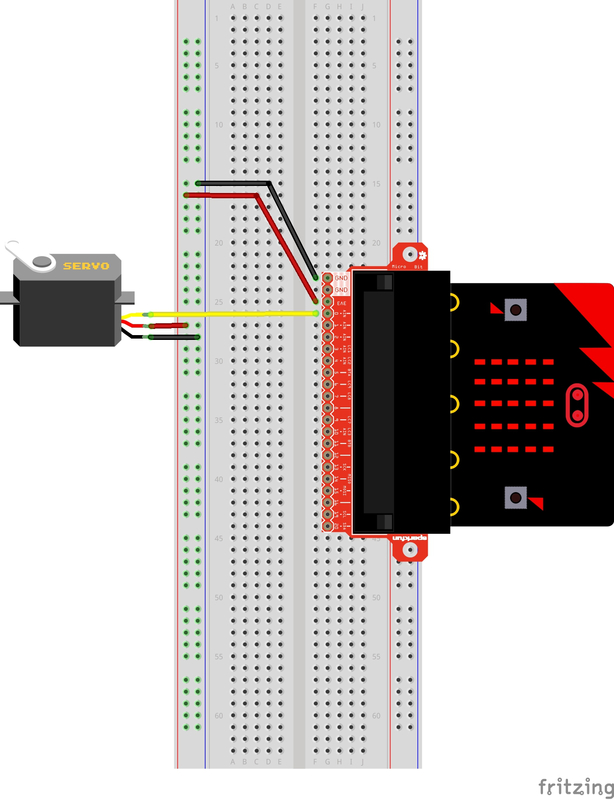 The Servo Class is called in statement with pin 0 as its argument. The .write_angle() function is how the servo is moved --- by the number specified in the parentheses mapped to degrees on the servo motor. When powered up you should see the servo move to a single location (0 degrees) and then start to sweep to 180 degrees back and forth until you turn it off or tell it to go to a different angle. CHALLENGE: How would you modify this code to get the servo to sweep to 180 degrees on button A pressed? Even with colored wires, it is still shockingly easy to plug a servo in backward. This might be the case. A mistake we made a time or two was simply forgetting to connect the power (red and black wires) to 3.3 volts and ground (GND).